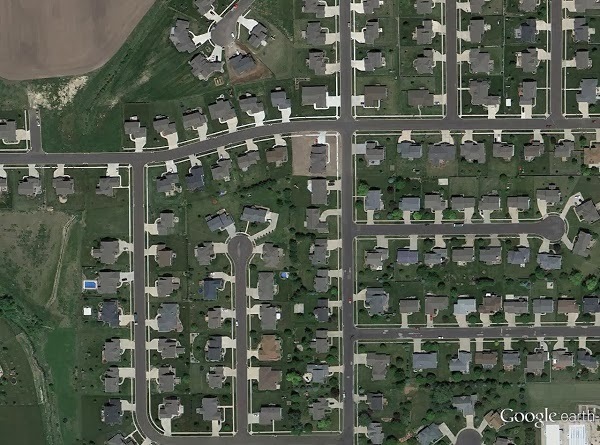 Above is a side-by-side comparison of two satellite photos. 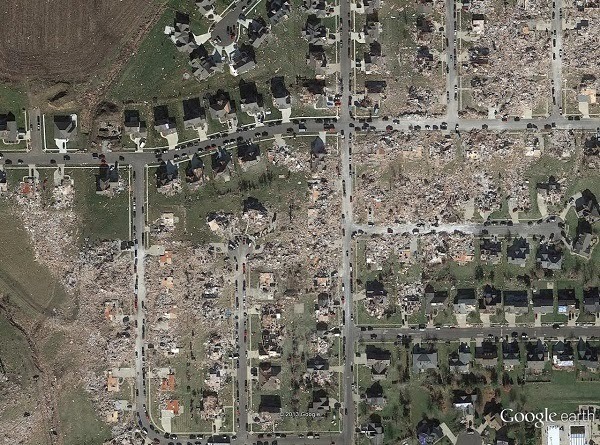 One satellite photo captures the town as it was on May 15, 2012. The other immortalizes Washington as it was on November 18, just one day after being sacked by an EF4 tornado packing winds between 170 and 190 miles per hour. The before/after slider script uses the jQuery library. As telling as these satellite images are, they aren't necessarily the highest-resolution that one could obtain with existing technology. These photos are about 30 centimeters per pixel in resolution, meaning the smallest feature you can make out in the image is an object about one foot by one foot square. Drones, on the other hand, fly much closer to the ground and can achieve much higher resolution, even with consumer point-and-shoot cameras. At an altitude of 400 feet, a drone can provide anywhere between 5 and 3 centimeter resolution, depending on the camera and lens. Lower altitude provides even higher resolution. My mapping drone wasn't set up in time to respond to the November outbreak, but I was able to deploy a small quadrotor drone in another small Illinois town that was struck with a tornado. I wrote about that experience on DroneJournalism.org. As nice as it was even to have an inexpensive camera drone at my disposal (I showed the footage to my students in the Drones for Schools program at the National Science Foundation grant where I work), a mapping drone would have told me so much more about what happened to the buildings and people of Gifford. Why's that? It's all about data. As I wrote back in in 2011, mapping storm damage can be valuable for a journalism investigation. In 1992, Steve Doig, a computer-assisted reporting specialist and journalism professor who formerly worked for the Miami Herald, once used housing and hurricane damage data to show that new houses in Miami-Dade county were not being built to a sufficiently high standard. Doig relied on Red Cross data for his report, but with today's technology, it's not hard to imagine such a report being replicated from drone-gathered GIS data. Doing so also would allow citizens and journalists to independently verify government data (see also "We need more drones because we’re having more big disasters"). Below is video from my quadrotor drone, above Gifford, Ill.